Both sides of this system are magnets, which are attached to a steel plate that has a central steel pin. The central pin protrudes on the male side and is recessed on the female side. When closed, this configuration prevents sideways slipping. 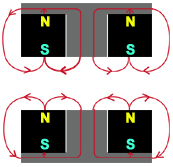 In our double magnet system, the two magnets attract each other directly (North pole to South pole) and also through a steel circuit (described here). Both central pins are level with the surface. 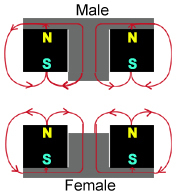 The two magnets attract each other directly (North pole to South pole) and also through a steel circuit (described here). Since both pins are level with the surface, these magnets will close even if they aren't lined up exactly.